Neem tree has been used as medicine throughout the world due to its vast properties. A fast-growing Neem tree, (Azadirachta indica) can reach a height of about (115-131 feet)15 to 20 meters. The Neem tree trunk is straight, short and has a diameter of (4 feet) 1.2 meters, Neem is widely cultivated in tropical and subtropical regions of India, Myanmar, Bangladesh, Sri Lanka, Malaysia, and Pakistan. Young leaves are reddish to dark purple and become green pinnate leaves at maturity. The fragrant white flowers are arranged in panicles hanging, about 25 cm in length. Neem tree is also known as’ Divine Tree “in India. 1. Neem is used in vitiated pitta conditions, hyperdipsia, leprosy, skin diseases, eczema, leucoderma, pruritus, intermittent fever, wounds, and ulcers, burning sensation, tumors, lymph tuberculosis, anorexia, vomiting, dyspepsia, intestinal worms, liver, cough, bronchitis, inflammation, and fatigue. 2. Neem products have medicinal properties that have proven to be anti-diabetic, anti-fungal, antiviral, antibacterial, and sedatives and anti-fertility. 3. Patients suffering from chickenpox are recommended to sleep on Neem leaves. Are known to neutralize more than 500 worldwide pests, including insects, mites, ticks, and nematodes, affecting their behavior and physiology. 4. Neem tree Gum is used as a bulking agent to prepare special food for diabetics. Its branches are used for cleaning teeth. 5. Neem oil is used for the preparation of cosmetics such as creams, shampoo, soap, balms, etc. which are useful for the treatment of acne, to maintain skin elasticity, and skin care. 6. Neem leaf extract is useful in the treatment of malaria and blood purification. 7. A decoction can be prepared from the roots of the Neem tree and is taken to relieve fever. The paste of Neem leaves is applied on the skin to treat acne. 8. Neem leaves are added to the bath to help the skin to maintain perfect condition, the leaf extract has anti-bacterial properties and regular use can cure many types of skin diseases. 9. Neem helps prevent hemorrhoids by helping the body rid itself of waste and prevent constipation (which is probably one of the leading cause’s particular of hemorrhoids). If applied topically to external hemorrhoids, which will soften and help to manage bleeding and itching. Thanks to its soothing properties of anti-inflammatory, anti-bacterial and pain. 10. The crushed leaves of Neem are applied to lacerated wounds, because of its antiseptic properties, along with its power to promote healthy granulation tissue and scar healing. 1. 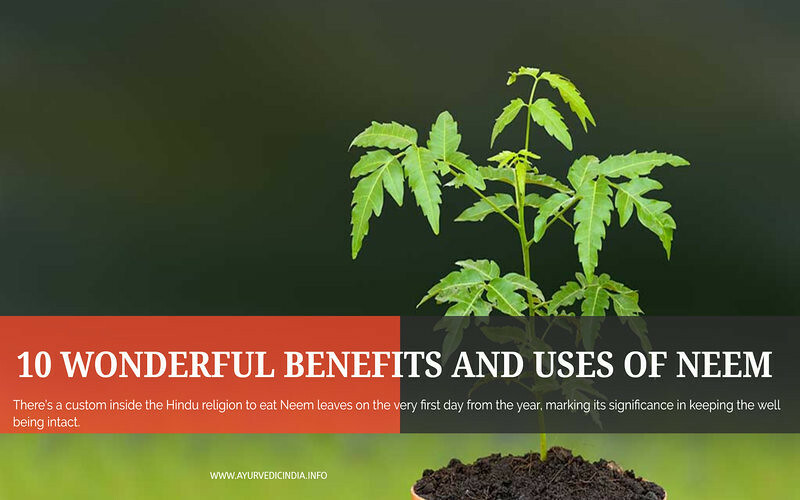 There’s a custom inside the Hindu religion to eat Neem leaves on the very first day from the year, marking its significance in keeping the well being intact. 2. In Andhra Pradesh and Karnataka, Neem leaves are used to prepare a dish called Ugadi Pachhadi which is a type of curry made with flowers of Neem. 3. Neem flowers are mixed with beautiful (unrefined brown sugar or brown sugar) and offered to friends and family, as a symbol of sweet and bitter events in the upcoming New Year. 4. In the Hindu tradition, individuals try to heat-related illnesses such as measles, smallpox modest, chickenpox, sweating, prickly heat disorder, and rash. Neem leaves have antiseptic, antibacterial, and anti-fungal and as a result of that, with grace to worship God with Neem leaves and turmeric powder. Today neem plant (Azadirachta indica) has fascinated millions of people worldwide due to its wide range of medicinal properties. Neem has been extensively used in Ayurveda, Unani and Homoeopathic medicine since ancient times. Neem produces a vast variety of biologically active compounds that are chemically varied; it has more than 140 compounds, which have been formed in different parts of neem. All parts of the neem tree such as flowers, leaves, fruits, seeds, bark, and roots have been used traditionally for medication in infections, inflammation, skin diseases, fever as well as dental disorders. Below are some of the medicinal uses of neem plant in points with its properties. 1. Immunostimulant Activity: It is also known as immunostimulators, it is bodies (ie.nutrients) that stimulate the immune system by generating or by increasing the activity of any of these components. Neem tree extract of bark, leaf, and oil possesses this immunostimulant activity. 2. Anti-inflammatory: Neem tree has (NSAIDS) Non-steroidal anti-inflammatory drugs such as ibuprofen, which are widely used to treat arthritis, but they are often accompanying with side effects. Among many uses, neem is also the most commonly used herbal medicines to treat arthritis. 3.Antihyperglycaemic: Regular consumption of neem leaves extract can remarkably lower blood-sugar level and also prevents epinephrine as well as glucose-induced hypoglycemia. In the study, it has been found that leaf extracts and seed oil have a hypoglycaemic effect that can be useful to diabetic patients. 4. Antiulcer effect: An ulcer is mainly defined as an inflamed break in the skin or the mucous membrane lining in the alimentary tract. Disturbance of the normal equilibrium caused by either enhanced aggression or diminished mucosal resistance sources an ulcer. Neem leaf and bark have been highly antacid secretory that can work as an anti-ulcer remedy. 5.Antimalarial activity: Neem has properties called gedunin which is very effective for treating malaria. It is due to this property in neem seed and leaf extracts are effective at both chloroquine-resistant and sensitive strain malarial parasites. Neem is used to treat malaria fevers in Ayurveda for ages. Note: Neem has natural anti-oxidant properties that can protect the liver and kidneys and vital organ of our body, only if proper amount of dose is consumed. If you intake excess amount of Neem in any form it may cause serious damage to these vital organs. These may cause side effects such as jaundice, yellowing of the skin, urinary tract infections such as reduced production of urine. Its very useful to us.It is one of most important tree that Indians have trusted for years to prepare different medicines which can be used as the treatment for more than 100 diseases.